It is a perfect tool for advanced users and professional WiFi network analysts and administrators to control their office wireless network performance and who is connected to it, identify access point data transmission speeds, andD optimize their company’s WiFi network channels. Resolve incidences and verify the good performance of your wireless networks with a unique set of functionalities not available in any other software today. (802.11a/b/g/n/ac) and update obsolete devices that lower your WiFi speed. by access points and WiFi clients, and a complete list of supported data transmission rates through deep network packet inspection to ensure a fast and efficient data transmission. by access points and WiFi devices to help identify data transmission and network coverage issues. on all WiFi devices in range. by replacing the MAC field with a description for easier network analysis. 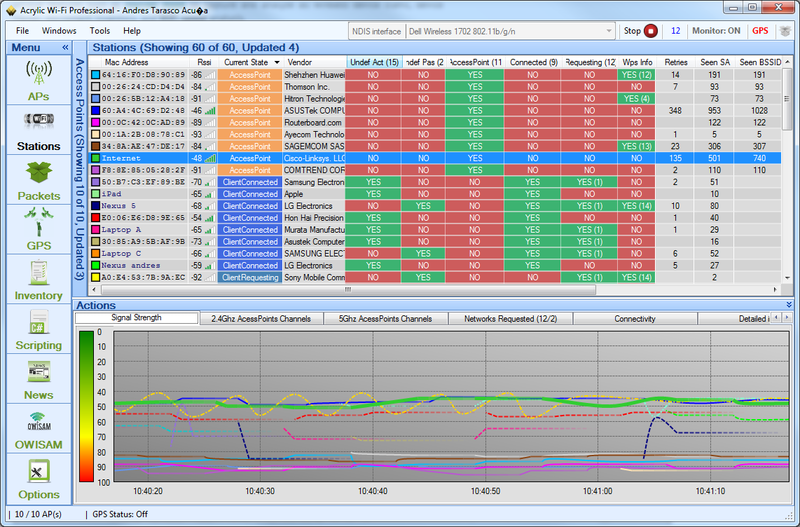 to visualize all devices and packages with Airpcap cards and with compatible WiFi hardware. Detailed View: Get device model information and capabilities on device detailed view.